Research Report on Disability Employment and Inclusion | Service Coordination, Inc.
Read and share the recently released report called Getting to Equal: The Disability Inclusion Advantage. The report was produced in partnership with Disability:IN and the American Association of People with Disabilities (AAPD). The report sought to answer the following question: Is there a positive correlation between how inclusive a company is of persons with disabilities and its financial performance? To find out, researchers took an in-depth look at companies participating in the Disability Equality Index over the past four years. The Disability Equality Index is an annual transparent bench-marking tool conducted by Disability:IN and the AAPD that gives U.S. businesses an objective score on their disability inclusion policies and practices. 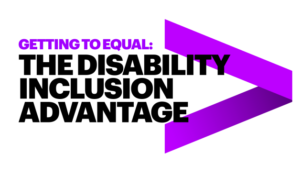 According to the report: “Our research found that a correlation does exist and it also shows just how much companies stand to gain if they welcome persons with disabilities, an untapped talent pool of 10.7 million people. Companies that embrace best practices for including persons with disabilities also performed better financially, outperforming other companies in revenue, net income and economic profit margins. To download and read a copy of the full report click here.